It's officially Spring, and with the warmer weather unfortunately comes fleas. These tiny little bugs like to make their unwelcome home on dog and cats. Fleas bite dogs and cats making a snack out of their blood and causing itchy skin. Many pets are allergic to fleas and their bites cause FAD - Flea Allergy Dermatitis. For pets with FAD, a single flea bit can mean severe itching for a few weeks. That's why it's important to use a good form of flea prevention on your pet, especially if they have FAD. One thing I heard a lot from clients at the veterinary hospital was "Oh, he doesn't have fleas so we don't need any flea prevention" or "The dog only goes out to use the bathroom" or "The cat is indoor only". Let me just say that it's OK to admit that you saw a flea on your pet the other day. It's normal, it happens. You don't have to be in flea denial. And if you aren't in flea denial, have you ever actually looked for fleas on your pet? When I was a vet tech, one of the clients nicknamed me "The Flea Girl". It's not exactly a name I was really proud of, but I got the name because about 80% (just guessing, it might actually be higher) of the pets that I saw at the hospital I would find a flea on. Many clients' excuse was "Oh, he must of got that one single flea while he was here". Possible I suppose, but still unlikely. Especially since I just found another one. 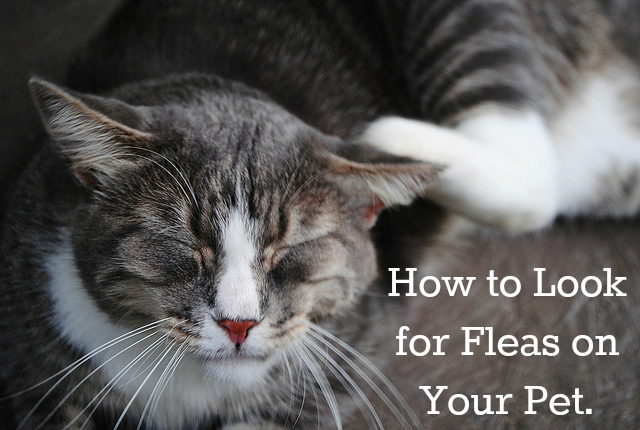 Many pet parents these days like to try more natural solutions to the pesky flea problem. Which is fine, but you just need to be more diligent in using them. In many cases, natural flea products need to be used on a daily basis. You should probably be checking your dog or cat for fleas daily if you are using natural flea repellent products to make sure they are working. I do it with my own dog, especially when it warms up outside. In fact, I was just checking her today and found 2 fleas. Uh oh! Time to get that flea prevention out. Here's what I do and where I look during Shiner's routine flea inspection. Fleas like to live in certain places on a dog or cat's body. First, check the back of the neck. Pull back the fur and look for moving black fleas or "flea dirt" which is flea poop. Check behind the base of the ears too. Next, check the base of your dog or cat's tail. Another popular spot for fleas on pets. Lastly, check the back of your pet's hind legs. Feel free to look all over your pet's body after checking these places, but just remember that these spots are favorites for fleas. Flea combs are a great tool to use, especially for cats. Stay healthy and NOT itchy this Spring! If you're pro-active, you can nip the problem in the bud before it gets out of hand. Let us know what kinds of flea prevention you like to use for your dog or cat in the comments! Yikes no fleas here as she is religious when it comes to our Frontline. Have a super Saturday. Glad to hear that Molly! We are waiting for my flea treatment and I hope it comes in time. We will see many doggies next weekend, so I think we better use frontline before I turn into a Flea-Hotel :o) Have a great satuirday! Flea hotels are not fun Easy! I hope it comes in time too. Interesting as always. Fortunately we have been a flea free house! No spring here, this morning it is in the single digits again, but we are scheduled for our flea treatment in a couple days. Paws crossed, but Mom has never had a flea problem and we want to keep it that way. The fleas down here in Texas can get pretty bad unfortunately =/ Especially this time of year it seems. Aw Loupi! There are lots of other dogs and kitties who hate it too. Fleas are the worst with huskies! they have SO much fur, so we really need to make sure we prevent those little buggers! More fur to hide under I suppose. Kamana has had fleas before. I always give him the one monthly treatment of the liquid flea treatment, but I may switch over and try a tablet. The liquid gets all over the place and is messier on him because he doesn't have long hair. I know what you mean. The tablets seem to be becoming more and more popular. But it's no wonder why. Bentley acts like those drops burn his skin. My Golden was allergic to them, his hair fell out and it was horrible. I have tried different kinds, but I'm just not sold on one in particular. We have mosquitoes so I usually look for one that supposedly repels those little blood suckers! BOL! Do you recommend a particular kind? I really want to use something. Bark More, Growl Less Barking from the Bayou! Well, my favorite is Advantix. Although Bentley might act the same if you used those, or you may have used them already. If you want a natural repellent, I've found that neem oil works good. I have a neem oil spray from Wondercide that I like, but you will have to re-apply very often. I just can't imagine anyone sending you nasty letters?! Just seems crazy to me. Doesn't seem like anyone's place for all that nonsense anyways. Oh yes I remember! I've heard that cedar wood works pretty good. I think we have a spray with that in it. A natural remedy that works for a few days is pretty good! Thankfully I don't have many ticks here which is good because I can't stand them! I have found a total of 3 on Shiner in her lifetime. We have been real lucky here too and we hope it stays that way! great post and good reminder! a friend once told me that reptiles also have a kind of fleas, but when I look it up in google, it said that turtles have no fleas because they aren't mammals. What do you think, as you work in vet? Hmmm your friend must be talking about something completely different. They definitely don't get these kinds of fleas, but I guess it's possible for them to get some other kind of external parasite. Of course, I don't know of any or have never heard of any before. I can't thank you enough for this post! We have three indoor cats who have not come in contact with any other animals. In the last few days, all three are acting like they have fleas! Thank you for the great information - gotta go. I am on the case! Usually for indoor cats, it's the dogs that bring fleas in. But since you don't have any, that's not the case. It is always possible for you to bring them in though. Hope you don't find anything in your search. Sure I'll send you an email in just a minute. Thankfully, fleas don't thrive here in Denver. I have no idea why, but they don't. Back in Indiana, it wasn't uncommon for pets to get fleas, though. They really do like certain areas more than others. Seems like warm humid places are there favorites I think. They are bad here in the Spring and Fall, but not during our super hot summers usually. Good post flea girl lol sorry I mean Ann, What do you know about garlic being used as a preventive, also our main flea killer Frontline doesn't seem to be as effective anymore apperently the fleas are becoming immune to the it. Time for us to find a new prouct. LOL you're not being mean... you're right about Frontline as we have the same issues with it here. One thing these companies don't talk about much is that sometimes, these products need to be applied every 3 weeks instead of each month. I like Advantix, but not sure if it's available in the UK? We are still frozen her so not fleas yet...lol. Good advice though. Thanks for the great tips! Will be checking them out as spring moves into full swing in the coming weeks. I'm definitely taking notes of this. I have a cat and I'm starting to get paranoid because he's been scratching his head unusually a lot lately. Thanks! Hey May, another thing that comes to mind when you mention him scratching his head is an ear infection or ear mites. You might want to take a peak in there and see if they are dirty too.